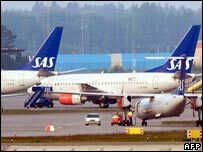 Scandinavian Airlines (SAS) has said it will sell its 20% stake in Britain's BMI to reduce costs and lift profits. The plans are part of a move to increase pre-tax income to about 4bn Swedish Kronor ($551m; £280m) per year and cut costs by SKr2.8bn by 2011. SAS said it was in talks with Lufthansa about the future of BMI. If Lufthansa were to buy SAS's holding it would mark a big step towards the German carrier gaining a stronghold at London's Heathrow airport. The German national airline already owns almost 30% of BMI and, from December, has the option to buy shares from BMI chairman Sir Michael Bishop, who currently has a controlling stake in the group. Therefore, Lufthansa could potentially own BMI by next year. As BMI holds 12% of take-off and landing slots at Heathrow, this would be a very appealing prospect, market experts say. It would mean Lufthansa would dramatically increase its market share to become the second-biggest airline after British Airways at Heathrow, just as transatlantic air travel is liberalised next spring. "It is natural that we together with Lufthansa talk about BMI's future," said SAS spokesman Hans Ollongren.